This is an entry in the We Said Go Travel Writing Contest written by Wayne and Pat Dunlap from America. Thanks for your entry Wayne and Pat! What is your description of romantic paradise? How about sitting on a picturesque powdery white sandy beach under a thatch beach palapa sipping a margarita or cerveza (beer) enjoying the warm tropical Caribbean climate? Throw in swimming in warm crystal-clear turquoise water with gentle waves, bikini-clad beachgoers, long walks with warm breezes on palm tree lined white soft-sand beaches, dining at night in romantic soft-lit restaurants with romantic music, or partying to the wee hours of the morning. Add in world-class snorkeling and diving in one of the most magnificent offshore coral reefs in the world, a rich history of ancient Maya legacy with a Mexican flavor, special attractions of highly rated nature parks and Mayan ruins, and hotels suitable for everyone’s needs ranging from luxury all-inclusive 5-star resorts to charming seaside inns and $60/night budget hotels. For us, that’s pretty close to paradise. 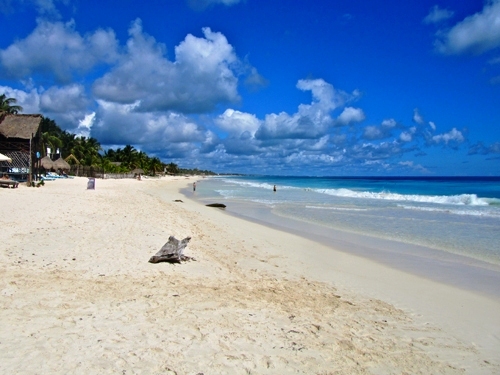 Welcome to Mexico’s Caribbean Riviera Maya in the Yucatan. 90 miles of beaches (some the most beautiful in the world) affords a wonderful relaxing romantic get away with activities for the more active such as great snorkeling and scuba diving in the Great Maya Reef – the second largest barrier reef in the world with more than 500 species of fish, manta rays, and sea turtles. There is also sailing, fishing, kayaking, windsurfing, and parasailing. The Mayan heritage gives Mexico’s Caribbean a different ambiance and cuisine than the rest of Mexico with a mythical history. At the center of the Mexico’s Caribbean Riviera Maya and its largest city, cosmopolitan Playa del Carmen (know locally as just ‘Playa’) is now Mexico’s fastest growing city. Along mile-long pedestrian-only 5th Avenue (Avenida Quinta), you can stroll a cobblestone-like pavement of shops, boutiques, intimate hotels, restaurants, and sidewalk cafes. 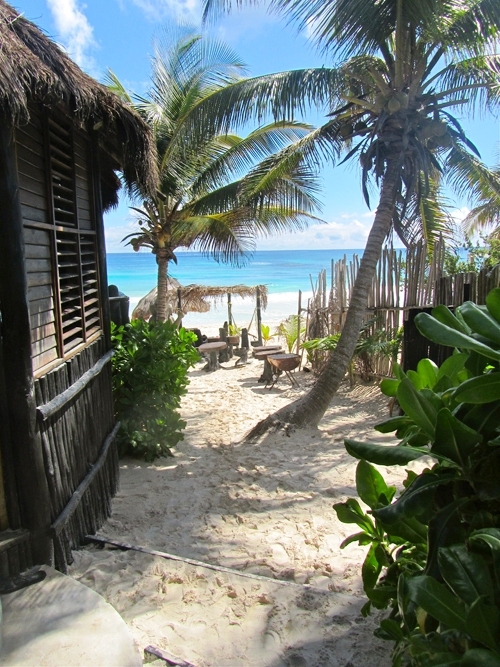 We loved Tulum about 40 miles south of Playa del Carmen. Although Tulum is rapidly upgrading (with increasing prices), it is what Playa del Carmen once was – ideal for solitude, contemplation, and communing with nature. With no Cancun-style big hotels, Tulum’s stunning uncrowded beaches have small beach cabanas and chic eco-hotels nestled among palm trees offering a nice blend of laid-back ecological on-the-beach experience with modern comforts falling to sleep listening to gentle ocean waves. Many have their own small restaurant on the beach. Near Tulum are over 110 cenotes that are entrances to underground rivers flowing through massive limestone caves and caverns with stalagmites and stalactites. All rivers in the Yucatan run underground and two of the longest underground rivers in the world are located here. Snorkeling or scuba diving these wonders is an interesting excursion. Also near Tulum, there are also several highly rated eco-archaeological parks such as Xcaret and Xel-Ha affording many activities (i.e. beaches, snorkeling, zip lining, river tubing, jungle and cenote discovery, boat trips, animal exhibits, Mayan culture) and all-you-can eat (at Xel-Ha) for one price – kind of like an eco-Disneyland. The nearby Sian Ka’an Biosphere Reserve offers an even more authentic experience of the remarkable natural wonders of this region encompassing almost every ecosystem that exists in the Yucatan. To begin our trip, we stayed north of the Cancun. A 45-minute ferry ride takes you to Playa Norte on the island of Isla Mujeres, one of the loveliest beaches in the Caribbean with open-air beach restaurants and bars to idle the day away meeting other travelers from around the world. A wonderful signature island dish is Tik-n-chik, which is a whole fish marinated in achiote and grilled. Great snorkeling trips can be arranged on Isla Mujeres or you can rent a golf cart and explore this beautiful 4-mile long island. Helpful travel planning tips… Peak travel season (and peak prices) is from November to April. Because summers can be hot, this is a nice time to come because it is the coolest time of year (high temperatures averaging about 84ºF, 29ºC). Locals told us that early May and late October are good off-season times for better prices. Although we went to Mexico’s Caribbean Riviera Maya in the middle of the peak season, we were able to find some good deals using savvy traveler’s techniques. Mexico’s Caribbean Riviera Maya is serviced by Cancun’s modern airport, English is widely spoken, people are very friendly, the food is very good with a wide selection of dining options, accommodations are available for everyone’s taste and budget, transportation around the region is efficient and inexpensive using buses and collectivos (air-conditioned vans), and using common sense, we never feared for our safety. USA Today said the Mexico’s Caribbean Mayan Riviera was the “Hot travel trend for 2012″ and will probably be even more popular in the future. In fact, many cities have already increased air service to Mexico because of the boost in travel demands.